Pinball Medics maintains a varied inventory of games for rental. We can provide anywhere from one machine to many, depending on your needs. We specialize in Classic Pinball machines from the 1970’s to the 80’s, as well as all your favourite Golden Era Arcade Classic Video Games, like Pacman, Galaga, Frogger, Space Invaders, and many more. 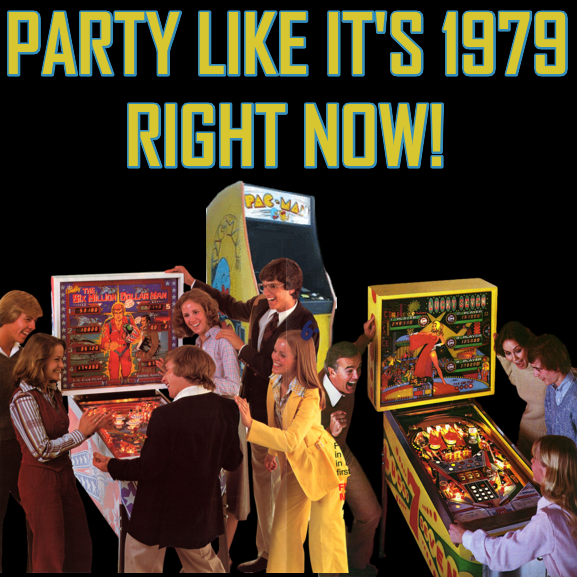 Whether you just want to play Pacman with a few friends for the weekend, turn your home or office into a 70’s arcade for a theme party, or for a special event, we can make your wish a reality. Having an authentic Pinball or Video Game, or several, is a unique yet sure fire smash hit with almost everyone from anywhere, or any time! Delivery Fee: delivery, set-up, tear-down, and removal in the Central Ottawa area is $200.00 for the first game, and Delivery Fee Combination Specials are available on many game combinations. More options will become available as we continue to expand our inventory, check here for updates! All games are set to unlimited free play. We do offer discounts on multi-day rentals. Please contact us to let us know what you require, and it would be our pleasure provide you with a free no obligation quote to get you the games you need. Surcharges will apply for large corporate, private, or other events, and all arrangements must be completed in advance with regards to access, insurance, payment, and all other details. Please contact us and we would be happy to discuss options. A minimum charge of $400.00, including delivery, applies to all rentals. All applicable taxes are extra. All prices are subject to any and all applicable taxes, and are subject to change from time to time. If the specific unit you require should be unavailable for any reason, a suitable equivalent will be substituted.